Silicone based, clear impregnation waterproofing agent. A solvent free product that maintains breathability of the surfaces it is applied on. 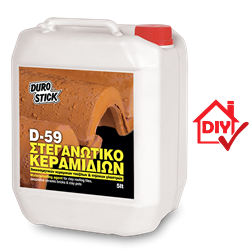 Suitable for protecting roofs lined with clay roofing tiles as well as building facades lined with decorative ceramic bricks. It does not create a surface film nor does it affect the surface color(s). The product does not shine not yellow. It protects surfaces from moisture absorption for at least 10 years. It prevents cracks from prolonged surface exposure to snow and frost. It does not favour the creation of mold, lichens and mildew on its surface, while it prevents mudrain built up. 200-400ml/m², depending on the absorbency of the surface.